The most essential item of protection for a motorcyclist is a helmet. The law requires all motorcyclists and their passengers (including sidecar passengers) to wear helmets that meet the standards set out in the Road Traffic Act 1961. 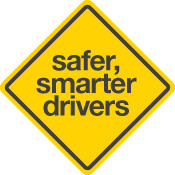 The 2016 review of this legislation included international standard ECE22.05 along with the Australian Standard AS 1698 for helmets. Helmets are available in many different makes and styles. There are two main types: full face and open face. Full-face helmets have a chin panel and an integrated visor that offer better face and eye protection than open-face helmets. Around half of all impacts to the head in motorcycle crashes occur to the face. Full-face helmets also offer better wind and sun protection. They do not impair peripheral vision. Light coloured helmets are generally cooler in summer than dark helmets, and brightly coloured helmets are more likely to be seen by other drivers. Make sure the helmet you buy is new and the right fit for your head. Never buy a second hand helmet. Hold the helmet by the chin straps. The opening of the helmet should face you with the front pointing down. Be sure it sits squarely on your head. It shouldn’t be tilted back on your head like a hat. It should fit snugly and may even feel a bit too tight until it is in place correctly. If the helmet has a neck roll, it shouldn’t push the helmet away from the back of your neck. On full-face helmets, press on the chin piece towards your face. The helmet or face shield should not touch your nose or chin. If it does, the helmet is too small. Move the helmet from side to side and up and down with your hands. If it fits properly, your skin should move as the helmet is moved. You should feel a slight, even pressure all over your head. A new helmet should be as tight as you can comfortably wear it. Helmets tend to loosen up over time as the comfort liner compresses with use. If your helmet is too large, it will move around when you least want it to; it can let in noise and wind; and worst of all, it may come off in a crash. With your head straight, try rolling the helmet forward off your head. You should not be able to pull it off. If you can, the helmet is too big. Look for pressure points on your head or face—indicated by sore places and red marks—which can be uncomfortable and cause a headache during a long ride. If the helmet is exerting any pressure points, try the next largest size or a different brand. 5. If you are still unsure about the fit, put the helmet back on and wear it around the store for a while. For more information on helmets, including protection and comfort ratings, visit the Consumer Rating and Safety of Helmets website www.crash.org.au. if the straps become worn. Clean your helmet only with mild soapy water, as some chemicals and cleaners may weaken the shell. Only helmet visors and goggles can properly protect your eyes from wind, dust, rain, insects and stones thrown up by other vehicles. Motorcycle screens (fairings) do not provide adequate protection for the eyes—you need to wear a visor or goggles as well. You might also consider buying a visor equipped with a de-mister. Purpose-made gloves are the second most important item of safety gear for motorcyclists after a helmet. Hands often touch down first during a crash, and are likely to be seriously injured even at low speeds if a rider is not wearing gloves. a gauntlet that overlaps the jacket sleeve. Wearing good quality protective clothing that is specifically designed for motorcycle use and made by a reputable manufacturer can significantly reduce injury in a crash, particularly abrasions and lacerations. 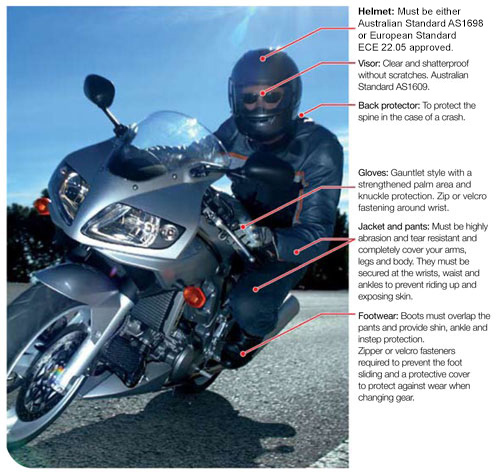 Motorcycle protective clothing aims to prevent abrasion and provide impact protection to exposed areas such as elbows and knees. Human skin is very susceptible to abrasion from sliding friction. Without protective clothing, it is likely that a rider sliding on bitumen will lose approximately 1mm of flesh for every 2km/h the rider is travelling over 40km/h. Sliding on bitumen can also abrade bones, which can result in fatal infections. Even when the skin is fully covered by protective clothing, abrasion injuries can still occur in the event of a crash. You have a better chance of being seen by other road users if your protective clothing is brightly coloured. Research shows that motorcyclist are less likely to be involved in a motorcycle crash when they are wearing high-visibility or fluorescent clothing. 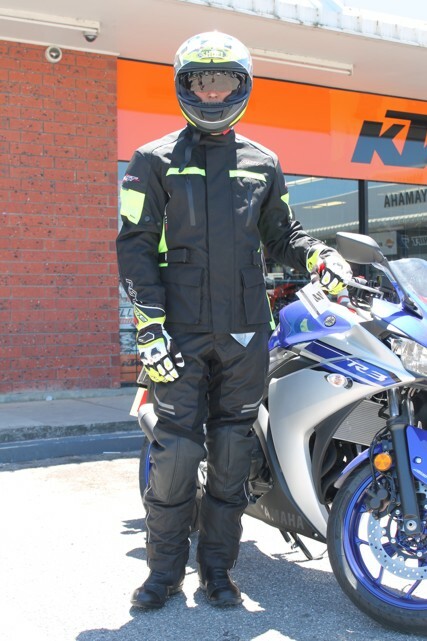 Clothes that are purpose-made for motorcycle riding not only give you better protection than ordinary clothes in the event of a crash, but they are generally more comfortable to wear while you ride. are highly resistant to abrasion and tearing. Purpose-made motorcycle boots can help prevent your feet and ankles from being crushed during a crash. a gear change cover to prevent wear. At a minimum, wear a rugged work or combat style boot with good grip, tight ankle support and a strong sole. a back protector to protect your spine in a crash. a kidney belt to support your lower back and reduce fatigue while riding.